In some places, water is dangerously scarce. In the African Sahel, generations of severe droughts have claimed millions of lives and have turned fertile pastures into swaths of desert. In Brazil, residents of the water-starved city of São Paulo have been frenetically digging homemade wells to mine fresh water, while schoolkids skip brushing their teeth as a conservation measure. And in California, devastating drought conditions in recent years idled nearly a half-million acres of crops and triggered the loss of tens of thousands of jobs. As areas of the planet dry up, scientists are hunting for new sources of fresh water. And they’re finding it in places many people wouldn’t expect: under the ocean. By some estimates, nearly 120,000 cubic miles of fresh water lies buried beneath the seafloor—more water than the sun evaporates from the Earth’s surface each year. These subsea reservoirs could someday be tapped like vast offshore wells to provide additional freshwater resources to an increasingly water-scarce planet, say Rob Evans and Dan Lizarralde, scientists at Woods Hole Oceanographic Institution. Evans and Lizarralde have been investigating what they think may be big pockets of fresh water sitting right off Martha’s Vineyard in New England, under the shallow continental shelf before the seafloor plunges steeply into the abyss. How did the water get there? One theory, the scientists say, is that fresh water may be percolating all the way down through the shelf from aquifers on land. Another theory suggests the fresh water came from glaciers during ice ages, when sea level was lower and the continental shelf was exposed dry land. The glaciers melted, and the fresh water was subsequently trapped beneath the seafloor when sea levels rose. Evans and Lizarralde have been anxiously awaiting the go-ahead on a proposal to drill water samples hundreds of feet below the shelf off Martha’s Vineyard to prove that subsea freshwater deposits are there and to determine their sources. That drilling proposal has been led by Mark Person, a hydrologist at New Mexico Institute of Mining and Technology, and Brandon Dugan at the Colorado School of Mines. Pools of subsea fresh water and brackish water (fresh water mixed with salt) have shown up thousands of miles from New England in places such as Tanzania and Indonesia, and as nearby as New Jersey, where an artesian freshwater spring sprang out of a borehole 60 miles offshore during scientific drilling in the 1970s. But only in recent years have scientists begun to focus on New England. 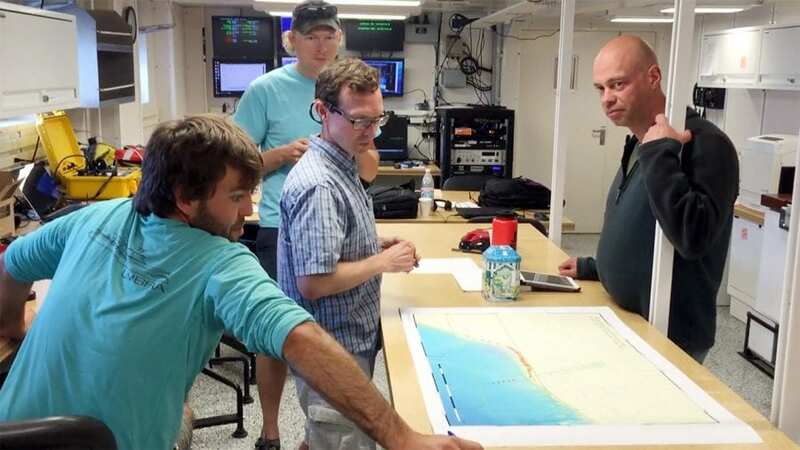 In 2009, Lizarralde and colleagues from the United States Geological Survey (USGS) began investigating erosion of the continental shelf off Martha’s Vineyard by using seismic surveys. These involve quietly pulsing acoustic waves through the ocean and into the seafloor to map out geological structures. The erosion, the scientists say, may have been caused by a long-gone ice sheet that poked its way onto the shelf. 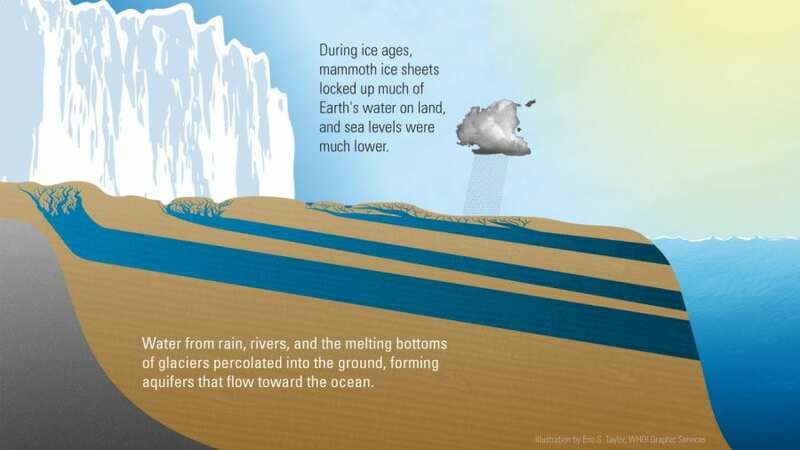 When it eventually melted, the ice sheet would have left deposits of fresh water trapped in pockets and pores below the shelf, which later became the seafloor. But the seismic data can’t tell you much about the types of fluids captured within these geological structures. So Evans, in collaboration with Kerry Key, a geophysicist at Scripps Institution of Oceanography, added a complementary technique to help characterize the fluids. 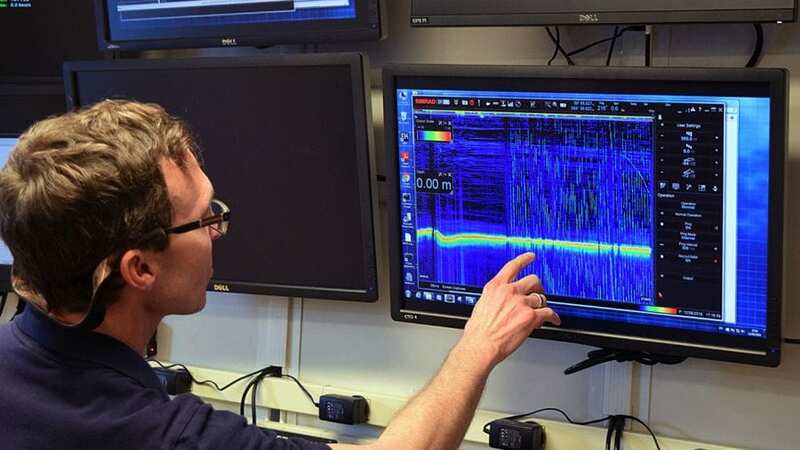 They adapted a technology called Controlled Source Electromagnetic (CSEM) sensing, which traditionally has been used by the oil industry to detect the presence of oil and gas in offshore locations. Conceptually, the process is straightforward. 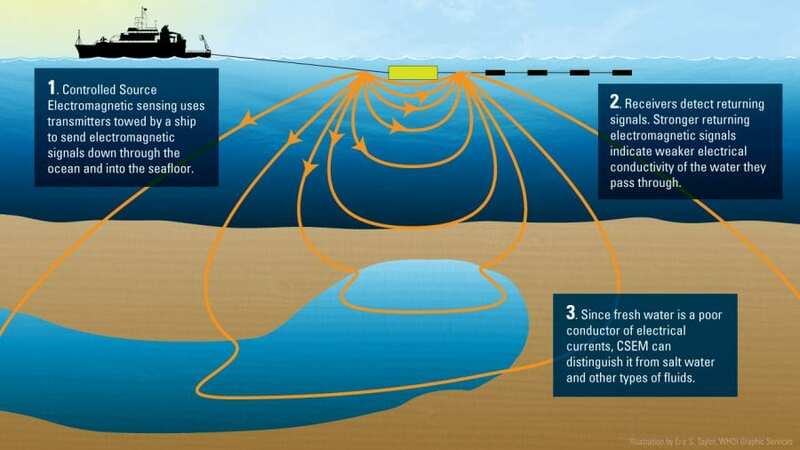 Transmitters towed by a ship send electromagnetic signals into the ocean. 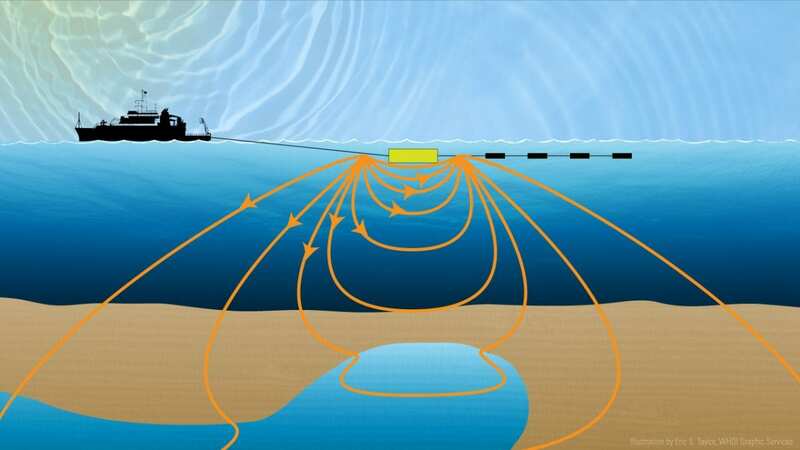 The electromagnetic fields diffuse down into the seafloor, becoming stronger or weaker depending on the conductivity of the material they are passing through. Since fresh water is a poor conductor of electrical currents, CSEM can distinguish it from salt water and other types of fluids. 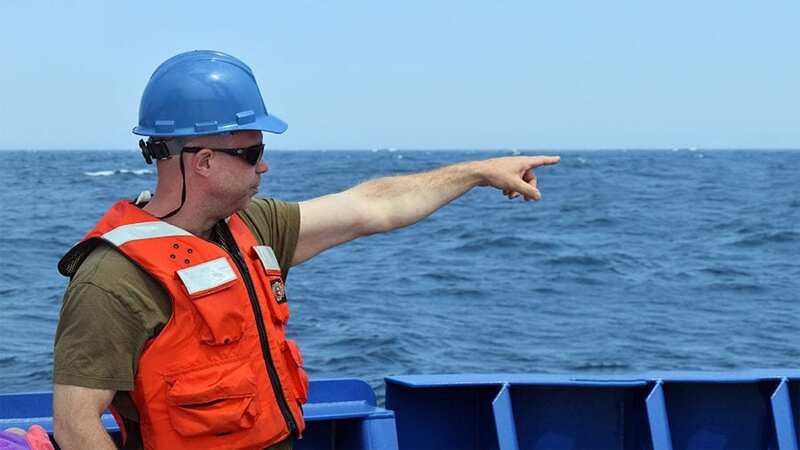 Using the technique, Evans was able to find signals of a layer of fresh water off the New Jersey coast in 2015—“at similar depths to where fresh water was originally discovered through drilling,” he said. Repurposing the CSEM technique for freshwater detection could be a significant step forward in the search for offshore fresh water, said Mark Person. Confirming the presence of fresh water in New England is one matter; understanding how it got there is another. Pinpointing its origin will determine if it’s a renewable source of water coming in from land-based aquifers, or a one-time supply of fossilized water that was deposited there by glaciers hundreds of thousands of years ago when sea levels were hundreds of feet lower than they are today. “Rainfall would have gotten down into permeable layers of the shelf that were exposed at the time, become buried and capped by impermeable layers, and ultimately would have been trapped,” Lizarralde said. Lizarralde says it’s important to know if a backup water supply exists off Martha’s Vineyard, but he is also interested in how freshwater reserves may be affecting the chemistry of the ocean. Estimates have shown that freshwater discharges can have ten times as many nutrients as river water. If there’s a large freshwater pool below the shelf, it may be one of the primary ways nutrients are getting off coastal New England and into the ocean. This has huge implications for the ocean food web and Earth’s climate. Nutrients fertilize the productivity of tiny marine phytoplankton, which convert carbon dioxide into organic carbon to grow and draw the greenhouse gas out of the atmosphere. In some places, the ocean floor has created a watertight seal above freshwater reservoirs for millennia. But like the heft of a river pushing on a weak levee, the buildup of water pressure near the seafloor can eventually cause some of the water under the seafloor to burst through. 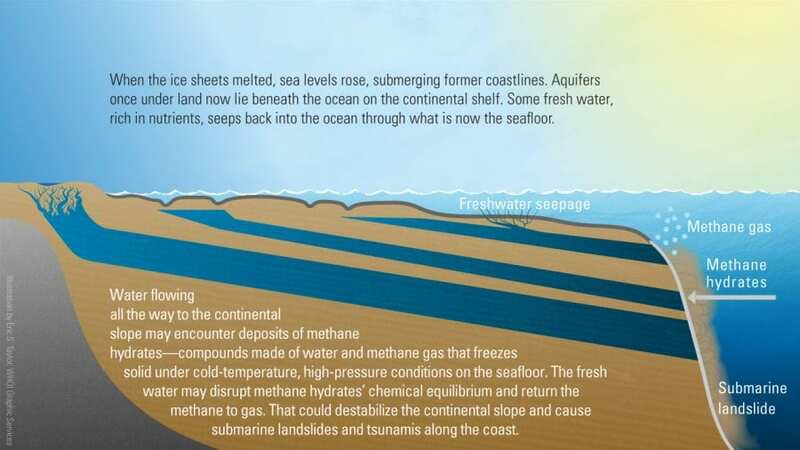 The fresh water may also encounter and disrupt the chemical equilibrium of frozen methane hydrate deposits on the slope, causing the methane to revert to gasesous form. That can destabilize the steep edge of the shelf and cause subsea landslides, which in turn can spawn tsunamis that could reach the nearby coast. Having seen evidence of shelf erosion off the New England coast in recent years, Evans, Lizarralde, and USGS scientists are investigating the potential link between freshwater deposits and apparent structural weaknesses in the continental shelf. Drilling for fresh water below the New England continental shelf will require busting through rocks and sediment hundreds of feet below the seafloor using a specialized drilling rig estimated to cost $4 million. Lizarralde is glad that momentum the project seems to be gaining. He feels the seismic and electromagnetic data supporting their hunches will help get buy-in from funding sources. Although New England isn’t prone to major water shortages anytime soon, the scientists feel the study will expand existing knowledge of what lies beneath the seafloor, which could be applied in regions of the world where access to safe water is more urgent. Oil companies could also be interested for another reason: They inject fresh water into oil fields to extract more oil from offshore wells and might welcome nearby freshwater sources. Evans is planning additional CSEM surveys between New Jersey and Martha’s Vineyard to try to establish clearer evidence that they’re seeing freshwater deposits. This research was funded by the National Science Foundation and the WHOI Access to the Sea Fund.